Psycho is an American 1960 suspense/horror movie directed by Alfred Hitchcock, from the screenplay by Joseph Stefano. The film is based on the novel of the same name by Robert Bloch, which was in turn inspired by the crimes of Wisconsin serial killer Ed Gein. The film depicts the encounter between a secretary, Marion Crane (Janet Leigh), who is in hiding at a motel after embezzling from her employer, and the motel's owner, Norman Bates (Anthony Perkins), and the aftermath of their encounter. 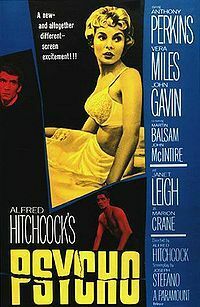 Psycho initially received mixed reviews, but outstanding box office returns prompted a re-review which was overwhelmingly positive and led to four Academy Award nominations. Psycho is now considered one of Hitchcock's best films and is highly praised as a work of cinematic art by international critics. The film spawned two sequels, a prequel, a remake, and an unsuccessful television spin-off.